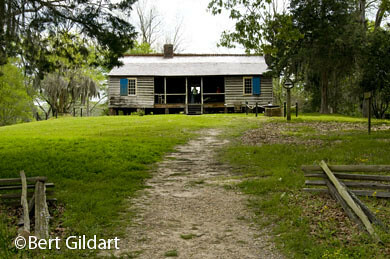 ©Bert Gildart: It’s been over 10 years since Janie and I drove the lower portion of the Natchez Trace, located deep in Mississippi, and we didn’t know what to expect when we arrived at Mount Locust, one of the earliest of old structures in Mississippi. Mount Locust was called a “Stand,” and many of its original structural components remain exactly as they were in 1810, when Stands served a vital function along the Trace, providing food and a place to sleep for weary travelers. Of course, we were pleased that the structure had not changed, but what we were even more pleased to see was that Eric Chamberlain was still interpreting not only the Stand’s early history, but his own very personally family association with Mount Locust. Mount Locust, park's only remaining original "Stand." Since 1991, as a park ranger, Eric Chamberlain has offered some particularly interesting insights. Chamberlain’s lineage traces to the first inhabitants of Mount Locust, back almost 200 years; back to his great, great, grandmother. According to Chamberlain, “Grandma Polly” was like so many other stand operators. She pitied those suffering from the swarms of insects, the heat, cold, rain, even snow, and often the outlaws. As a result, Chamberlain’s ancestors entered the business of operating a stand or inn. 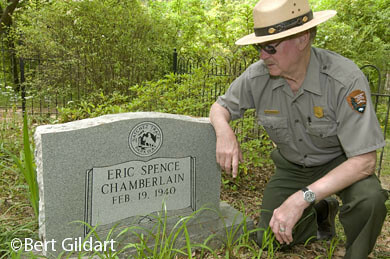 Eric Chamberlain’s forbearers played a prominent role in the development of the only stand that still remains along the Natchez Trace with its original materials. His ancestry is rooted in the nation’s history and family tradition maintains Andrew Jackson slept in the bed in which Chamberlain was born. Jackson used it once In 1813 while his men camped at nearby Shacklesford Springs, and again in 1812, during the Creek Indian Insurrection. On another occasion Jackson apparently spent Christmas day at the stand. Eric Chamberlain's gravesite, lacking the date of demise in epitaph. In keeping with the Trace interpretive philosophy, Chamberlain attempts to enliven the period between 1800 and 1820. Chamberlain’s “Grandma Polly” provided a service that assisted the thousands who once trod the Natchez Trace. According to Chamberlain, his “grandmother” moved to Mount Locust at the end of the American Revolutionary War as a 16-year-old bride. She had married William Ferguson in 1783, and that same year she and her husband purchased Mount Locust. Then with grant money they increased the small farm to 1, 215 acres and over the years produced a family of seven children. Farming was the family’s business, and they worked hard. Corn was their major crop, and, if it wasn’t sold, the family used it. As the years progressed, public duties claimed some of Ferguson’s time. In 1798, Ferguson was appointed first sheriff of Pickering County (now Jefferson County). About the same time, he attempted to found the town of Union and successfully attracted a doctor, as well as a number of residents. Ferguson hoped authorities would choose Union Town as the site of the county seat, but when they didn’t, Union lost much of its chance for survival. When Ferguson died in 1801, any remaining chance for the town’s survival passed with him. In 1801, “Grandma Polly” married James Chamberlain, resulting in four more sons. But Chamberlain was a drifter, and in 1810, he left Polly. To her fell the responsibility of raising the family and operating the stand. Travel peaked in 1810 when approximately 10,000 “Kaintucks” rode or hiked the Old Trace. Grandma Polly had her hands full. Once a coachman, refreshed from his work after dipping into the whiskey barrel, entered the tavern and announced to all present, “Cholera in Natchez.” The words devastated one man, who instantly keeled over, possibly from a heart attack. Little was known about the man, but he nevertheless rests in the Chamberlain family plot, a modest tombstone marking his passage. After 1825 travel along the Trace slowed, though the tavern continued to attract wealthy clients from Natchez, who sought respite from the bustle of city life. The house remained with the Chamberlains until 1937, when it was purchased by the National Park Service, though the house remained occupied until 1944. Eric Chamberlain shows room in which he was born. Today Mount Locust not only interprets and recalls history along the Trace, but also represents a period of time. It is one of the state’s oldest surviving structures and predates most ante-bellum homes in Natchez. 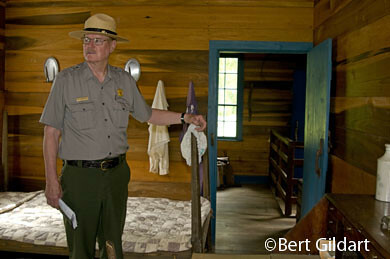 The Park Service has restored the house to an 1810 period to coincide with the year of greatest use. In places, 25% of the original materials remain, such as the sassafras beams on the rear gallery. The floor in the left front bedroom is also original as are the bricks in the walk around the house. The home preserves the essence of a number of activities the Chamberlains must have engaged in through the decades. On hand are period interpreters to embellish this evidence of past, for example, discussing the importance of cotton and the manner in which it was processed. But historical facts are limited and anecdotes many. Chamberlain enjoys recalling the latter. Once, according to him, a ranger appeared for work early one morning. As she bounded up the steps she was horrified to see a moccasin snake hanging from the door. Picking up an ax, she struck it over and over. Eventually she killed the snake, and left behind the marks on the door which you can see today. This entry was posted on Monday, April 13th, 2009 at 7:14 am and is filed under Books & Stories, National Lands, Outdoors, RV Travel. You can follow any responses to this entry through the RSS 2.0 feed. You can leave a response, or trackback from your own site. Bert what a fantastic piece. We were at Mt Locust today and didn’t put two and two together until we went to the cemetary. What a humbling man. Enjoyed it and your piece very much. Eric Chamberlain’s grandfather and my grandfather were brothers. I have visited Mt.Locust since I was a small child. I am now 87 years old and I appreciated your article very much. Brought many happy memories! Thank you.